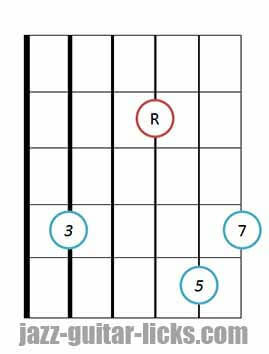 What are major seventh chords ? 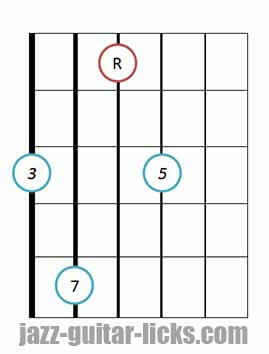 Major seventh chords consist of a root (1), a major third (3), a perfect fifth (5) and a major seventh (7). They are built by stacking thirds (major and minor). 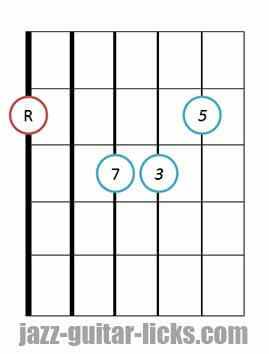 Jazz harmony is (traditionally) founded on chords constructed in thirds. Let's take a C major seventh chord. It is made up of C, E, G and B. You can notice that the interval between the first two notes is a major third. The interval between the second (E) and third note (G) is a minor third. And to finish the interval between G and B is a major third. 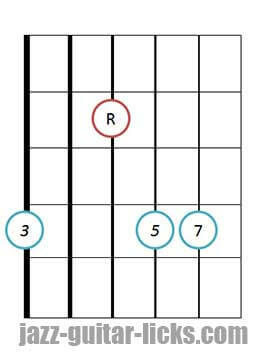 This is how a major seventh chord is built. 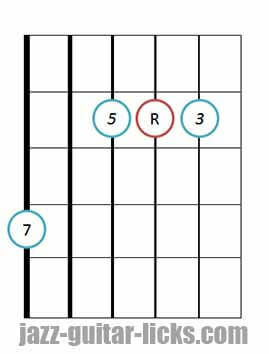 The other way to build major 7 chords is to take the first (1), the third (3), the perfect fifth (5) and the major seventh (7) of the major scale. For example. The major scale formula is: root (1), second (2), major third (3), fourth (4), fifth (5), sixth (6) and seventh (7). 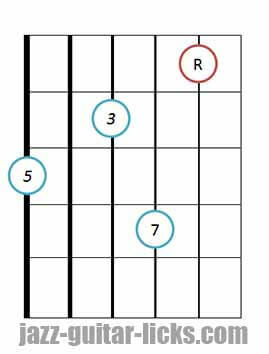 You just have to take the first, the third, the fifth and the seventh of any major scale and you will get a major seventh chord. 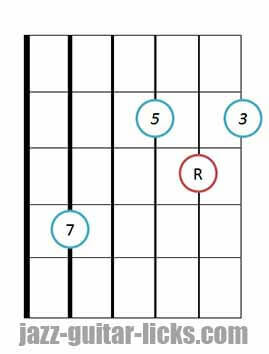 As it is shown below you can see that the C major 7 chord has an additional note (the seventh) in comparison with the basic major chord. 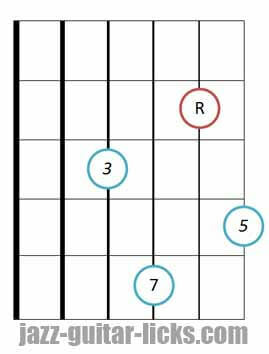 There are several different ways of writing the same chord or scale sound. 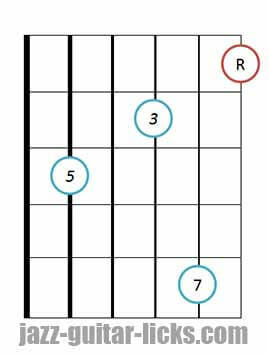 It is often complicated for a jazz student to become familiar with all the nomenclatures for writing chords. The most used symbols for major seventh chords (example in C) are CM7, C∆ and maj7. 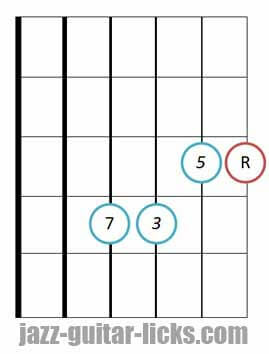 Drop 2 chords are the most popular chord voicings used in jazz guitar and are very important devices for comping or building chord melodies. They are built by dropping the second highest note of a four-notes close chord to the bass. 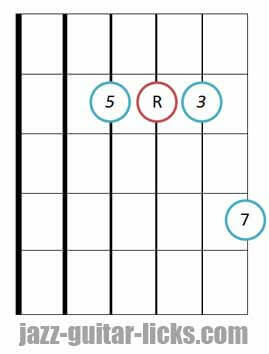 Major seventh close chord formula is 1-3-5-7 that gives the following drop 2 chord formula 5-1-3-7. The root of an inverted chord is not in the bass. In other words, it means that the notes of a chord are inverted. 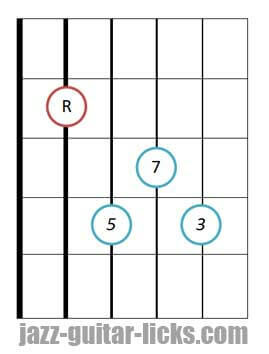 As you can see in the guitar diagrams above, there can be a third, a fifth or a seventh in the bass. 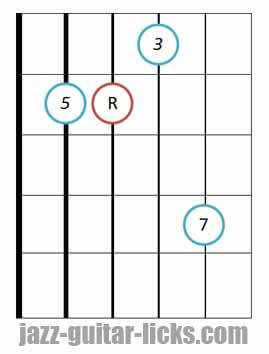 Here are the four drop 2 major seventh chord voicings (The term "voicings" refers to the order of notes in a chord). 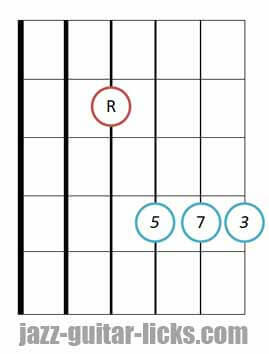 The three diagrams below include all the drop 2 chords and inversions in connection with the previous chart. The first schematic representation includes drop 2 chords built from the E-string. 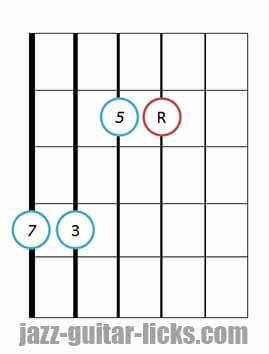 The chords in the second are built from the A-string and the third one includes chords built from the D-string. 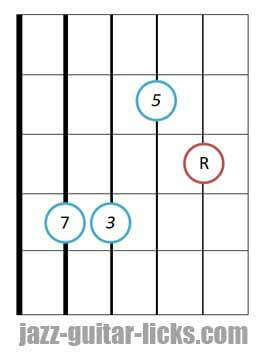 Each voicing is represented by a color, demonstrating at the same time the relationship between the four major seventh chord positions on the whole guitar neck. 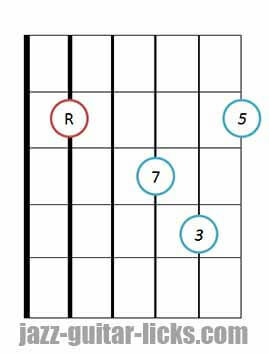 Drop 3 voicings are named thusly because the 3rd note in a closed position chord has been “dropped". In other words, the 3rd highest note in a closed position chord is lowered by an octave. 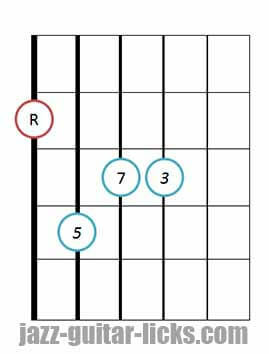 Notice that each drop 3 chord has a string skip between the lowest two notes. 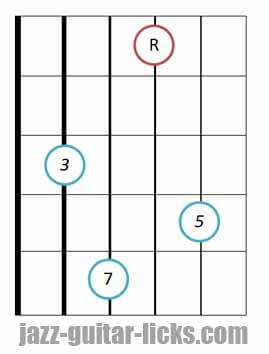 Drop 3 major seventh voicings. That's what the four drop 3 chords look like on the guitar neck. 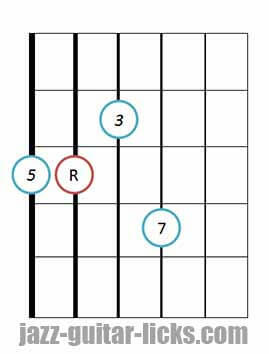 Drop 2 & 4 chords are built by moving the second and fourth note of a close position an octave down. Thus giving a new voicing R-3-5-7 which will serve as a basis for three other voicings (inversions).